This February’s ‘Teen Dating Violence Awareness Month’ will feel especially significant in light of the #MeToo movement, and, renewed interest in long-standing accusations of sexual misconduct against powerful men including R. Kelly. It is encouraging that people are finally paying attention to these serious allegations. However, with most of the attention placed on the accused and their subsequent fall from grace — can justice truly be served for survivors? We must also center our attention on the survivors, predominantly young and female, in light of the long-lasting negative impact they may carry throughout their lives as a result of trauma. In ignoring the voices of survivors, are we sentencing girls to a lifelong fight for agency? It seems so. Intimate partner violence (IPV) — physical, sexual, or emotional violence perpetrated by a romantic partner — occurs among girls between the ages of 16–24 at a rate that is triple the national average of survivors of any age. Issues of consent integral to the #MeToo movement are a part of IPV — between 40 and 45 percent of women in abusive relationships will be sexually assaulted during the course of the relationship. The face of IPV is overwhelmingly female. In the United States, 81 percent of women compared to 43 percent of men have suffered sexual harassment and/or assault. 51 percent of women compared to 17 percent of men have been touched without consent. The face of IPV is shockingly young. 1.5 million high school students across the country fall prey to IPV every year. One in three teenagers has experienced IPV, with violent behavior typically beginning when they were between the ages of 12–18. In Chicago, an investigation by the Chicago Tribune found that over a ten-year period, police investigated more than 520 cases of juvenile sexual assault and abuse in Chicago Public Schools. The consequences of early instances of IPV are negative, enduring, and sometimes deadly. Instances of IPV are more severe when the pattern of abuse begins during a victim’s teenage years. Globally, of 87,000 women murdered in 2017, 58 percent (50,460) of those deaths were caused by IPV. Fighting back can lead to prison. Most women who kill their partners cite self-defense as a motive and 70–80 percent of incarcerated women report that they have experienced IPV. Walking away from the relationship can have repercussions beyond those involved in the relationship. For example, Dr. Tamara O’Neal was murdered by a romantic partner at Mercy Hospital in Chicago in an incident that ended with Dr. O’Neal’s murderer also killing Chicago police officer Samuel Jimenez and Dayna Less, a pharmacy resident. IPV can contribute to drug or alcohol addiction — over 70 percent of women undergoing substance abuse treatment have been victims of violence; and, instances of violent assaults often correlate with the seriousness of a woman’s drug and/or alcohol addiction. Despite the magnitude of the problem, a mere 33 percent of teenagers experiencing IPV report telling anyone about the abuse. Only 81 percent of parents know that violence is an issue in teenage relationships. There may be a reason for that. Between Friends, an agency committed to eradicating domestic violence in Chicago, has been fighting IPV for years. The organization provides a range of services, including a prevention and education program called REACH (Relationship Education: A Choice for Hope). 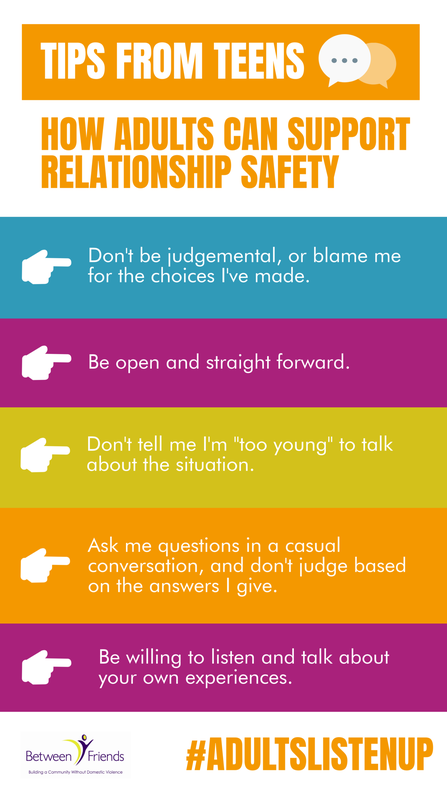 This program visits middle and high schools for eight weeks to talk about healthy relationships. In 2017, Between Friends surveyed 604 teenagers aged 11–18 in five Chicago Public Schools. The organization found that only 6.73 percent of teenagers reported that their parents or caregivers knew everything about their relationship. More concerning, the majority of teenagers responded that when discussing their relationships with parents or caregivers, they: ignored their feelings; were not taken seriously; were yelled at; or, were blamed when someone hurt them. These girls aren’t being heard, or worse, they are being willfully ignored. The polling led Between Friends to develop guiding tenets, including: believing in the power of youth voices in guiding conversations; trusting their leadership; and, engaging in cross generational dialogue to end abusive relationships. Between Friends asks you to help by listening to the voices of those most impacted by IPV — young girls. Using the hashtag #adultslistenup, Between Friends will highlight the voices of Chicago teenagers beginning with a Leadership Breakfast on February 1, 2019 and throughout the month of February. Organizations like Between Friends are working to amplify the voices of teen survivors. We can all help by centering their voices and listening up.